Classic Tuscan style for your garden. Whatever you decided to plant in it, it'll certainly add a touch of Mediterranean class to your home and garden! This weather resistant, plastic planter is UV stable and will really last the test of time meaning you can use it year in, year out. A far cheaper alternative to expensive ceramic or metal pots, it's lightweight and easy to transport around the garden while still providing a tough and durable container for plants. Finished off in a metallic paint it'll shine in the sun and help to provide spectacular garden displays for years to come! 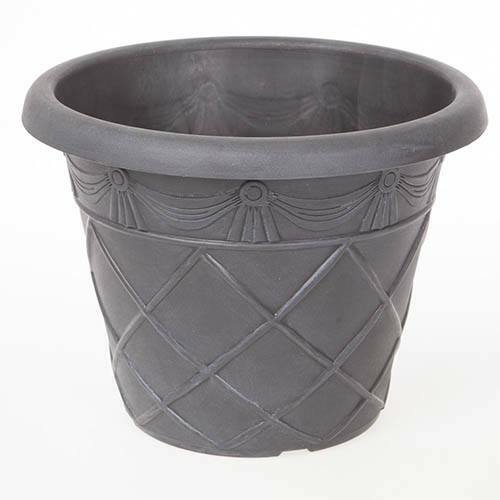 46cm (18.5in) Plastic Planter with an aged black finish. This stylish 'Tuscany' planter is ideal for finishing off displays, from colourful summer bedding and patio plants, to shrubs and small trees - whatever you decided to plant in it, it'll certainly add a touch of Mediterranean class to your home and garden! This weather resistant, plastic planter is UV stable and will really last the test of time meaning you can use it year in, year out. A far cheaper alternative to expensive ceramic or metal pots, it's lightweight and easy to transport around the garden while still providing a tough and durable container for plants.